Joshua 19:28 and Ebron, Rehob, Hammon, and Kanah, even to great Sidon. One of the oldest Phoenician cities, situated on a narrow plain between the range of Lebanon and the sea, in latitude 33 degrees 34 minutes nearly. The plain is well watered and fertile, about 10 miles long, extending from a little North of Sarepta to the Bostrenus (Nahr el-'Auly). The ancient city was situated near the northern end of the plain, surrounded with a strong wall. It possessed two harbors, the northern one about 500 yds. long by 200 wide, well protected by little islets and a breakwater, and a southern about 600 by 400 yards, surrounded on three sides by land, but open to the West, and thus exposed in bad weather. The date of the founding of the city is unknown, but we find it mentioned in the Tell el-Amarna Letters in the 14th century B.C., and in Genesis 10:19 it is the chief city of the Canaanites, and Joshua (Joshua 11:8) calls it Great Sidon. It led all the Phoenician cities in its early development of maritime affairs, its sailors being the first to launch out into the open sea out of sight of land and to sail by night, guiding themselves by the stars. They were the first to come into contact with the Greeks and we find the mention of them several times in Homer, while other Phoenician towns are not noticed. Sidon became early distinguished for its manufactures and the skill of its artisans, such as beautiful metal-work in silver and bronze and textile fabrics embroidered and dyed with the famous purple dye which became known as Tyrian, but which was earlier produced at Sidon. Notices of these choice articles are found in Homer, both in the Iliad and the Odyssey. Sidon had a monarchical form of government, as did all the Phoenician towns, but it also held a sort of hegemony over those to the South as far as the limit of Phoenicia. It likewise made one attempt to establish an inland colony at Laish or Dan, near the headwaters of the Jordan, but this ended in disaster (Judges 18:7, 27, 28). The attempt was not renewed, but many colonies were established over-sea. Citium, in Cyprus, was one of the earliest. (1) The independence of Sidon was lost when the kings of the XVIIIth and XIXth Dynasties of Egypt added Palestine and Syria to their dominions (1580-1205 B.C.). The kings of Sidon were allowed to remain on the throne as long as they paid tribute, and perhaps still exercised authority over the towns that had before been subject to them. When the power of Egypt declined under Amenhotep IV (1375-1358), the king of Sidon seems to have thrown off the yoke, as appears from the Tell el-Amarna Letters. Rib-addi of Gebal writes to the king of Egypt that Zimrida, king of Sidon, had joined the enemy, but Zimrida himself claims, in the letters he wrote, to be loyal, declaring that the town belonging to him had been taken by the Khabiri (Tab. 147). Sidon, with the other towns, eventually became independent of Egypt, and she retained the hegemony of the southern towns and perhaps added Dor, claimed by the Philistines, to her dominion. This may have been the reason for the war that took place about the middle of the 12th century B.C., in which the Philistines took and plundered Sidon, whose inhabitants fled to Tyre and gave the latter a great impetus. Sidon, however, recovered from the disaster and became powerful again. The Book of Judges claims that Israel was oppressed by Sidon (10:12), but it is probable Sidon stands here for Phoenicia in general, as being the chief town. (2) Sidon submitted to the Assyrian kings as did the Phoenician cities generally, but revolted against Sennacherib and again under Esar-haddon. The latter destroyed a large part of the city and carried off most of the inhabitants, replacing them by captives from Babylon and Elam, and renamed it Ir-Esar-had-don ("City of Esar-haddon"). The settlers readily mingled with the Phoenicians, and Sidon rose to power again when Assyria fell, was besieged by Nebuchadnezzar at the time of his siege of Jerusalem and Tyre, and was taken, having lost about half of its inhabitants by plague. The fall of Babylon gave another short period of independence, but the Persians gained control without difficulty, and Sidon was prominent in the Persian period as the leading naval power among the Phoenicians who aided their suzerain in his attacks upon Greece. In 351 B.C., Sidon rebelled under Tabnit II (Tennes), and called in the aid of Greek mercenaries to the number of 10,000; but Ochus, the Persian king, marched against him with a force of 300,000 infantry and 30,000 horse, which so frightened Tabnit that he betrayed the city to save his own life. But the citizens, learning of the treachery, first burned their fleet and then their houses, perishing with their wives and children rather than fall into the hands of Ochus, who butchered all whom he seized, Tabnit among them. It is said that 40,000 perished in the flames. A list of the kings of Sidon in the Persian period has been recovered from the inscriptions and the coins, but the dates of their reigns are not accurately known. The dynasty of the known kings begins with Esmunazar I, followed by Tabnit I, Amastoreth; Esmunazar II, Strato I (Bodastart), Tabnit II (Tennes) and Strato II. Inscriptions from the temple of Esmun recently discovered give the name of a Bodastart and a son Yatonmelik, but whether the first is one of the Stratos above mentioned or a third is uncertain; also whether the son ever reigned or not. As Bodastart calls himself the grandson of Esmunazar, he is probably Strato I who reigned about 374-363 B.C., and hence, his grandfather, Esmunazar I, must have reigned in 400 B.C. or earlier. Strato II was on the throne when Alexander took possession of Phoenicia and made no resistance to him, and even aided him in the siege of Tyre, which shows that Sidon had recovered after the terrible disaster it suffered in the time of Ochus. It perhaps looked upon the advance of Alexander with content as its avenger. The destruction of Tyre increased the importance of Sidon, and after the death of Alexander it became attached to the kingdom of the Ptolemies and remained so until the victory of Antiochus III over Scopas (198 B.C. ), when it passed to the Seleucids and from them to the Romans, who granted it a degree of autonomy with native magistrates and a council, and it was allowed to coin money in bronze. 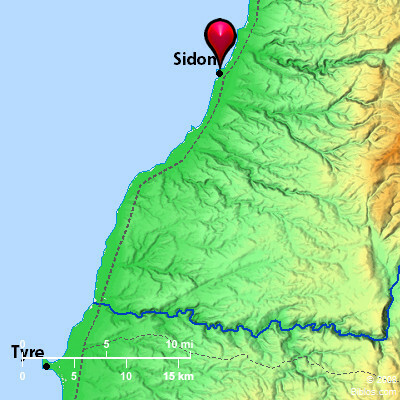 Sidon comes into view several times in the New Testament; first when Christ passed into the borders of Tyre and Sidon and healed the daughter of the Syro-phoenician woman (Mark 7:24-30); also when Herod Agrippa I received a delegation from Tyre and Sidon at Caesarea (Acts 12:20), where it appears to have been outside his jurisdiction. Paul, on his way to Rome, was permitted to visit some friends at Sidon (Acts 27:3). See also Matthew 11:21 and Mark 3:8.